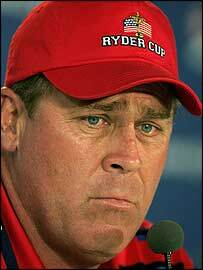 Never mind the golf, the real star at this Ryder Cup has been United States captain Hal Sutton. The strutting straight-talker from Shreveport, Louisiana has been the stand-out character at Oakland Hills all week and his media conferences have been standing room-only occasions. I've been licking my chops over it. I don't think he's in any sort of slump - I aspire to be in his slumps. Buckle your chin straps. On Tiger Woods' form before the Ryder Cup. The pep talk he would give to fire up Woods. Y'all have been kind of like a bad marriage partner. We've apologised for five years for what happened. Annoyed with Europe's obsession with the Brookline controversy. Look man, you're a star running back and I'm the best pulling guard you've ever seen. I'm going to run interference for you. Telling Chris Riley not to worry. I know maybe y'all haven't seen the plan, but we've seen the plan. Everybody is excited. They thanked me. They boiled with sincerity in their eyes. It wasn't lukewarm, it was boiling. Were Woods and Phil Mickelson happy to be paired together? Well, we made history today. After the US trailed Europe 6½ -1½ on day one. They would have been cheering pars and bogeys if they had been cheering. Why weren't the American fans getting fired up? We're going to have a team meeting. I'm going to put my cowboy hat back on. This time I may get the reins out too and make them wet. How can he make the players respond? You kept the Americans from getting skunked today. To Chris Riley after his half point in the fourballs. If I, a 42-year-old with a fat belly, went five straight matches in '99, I'm sure a 30-year-old flat-belly that's hyper can go four. To Chris Riley after he asked to be rested from the foursomes. We just never got the charisma going that we needed. I'm going to hug my kid tomorrow and everything will be great.